Helvette has been in the Vestments of the Shifting Sands for a really long time now. Probably since Legion came out and we could share discovered looks with other characters on the account. Of course the MAGE got the drop one day. But today I returned to the Mooncloth robe. I enjoy the blonde, white clothed shadow priest look. When I can SEE it. I really dislike not having the option to get out of shadow. Sitting in my fishing chair in Dalaran I can barely see Helvette. It looks way too shadowy and transparent. Dislike. But that’s beside the point. I varied it a little bit – I found these awesome bracers that are sort of metallic arm bands and I couldn’t let only the hands have some purplish in them – it wouldn’t look right. So I changed the belt, left the shoulders off, and gave myself a mask to not look too … good. Here’s the link to my Wowhead dressing room : Helvette’s Outfit and the Item comparison tool. There’s no reason why I’m wearing the Leggings of Absolution – they were just left over from the last outfit. I still have way too many issues with the shadow priest changes to count. I despise the new lore and the gibbering gnome shadow priest in my class order hall. So insulting. But … that pet needs getting! I particularly like the 3D model viewer on the Item comparison tool page. So I’m playing some World of Warcraft while here in Denver and waiting for The Secret World Legends to come out. So I started logging characters in and out, boosting, moving servers, everything I generally do when I’m not feeling direction in the game. 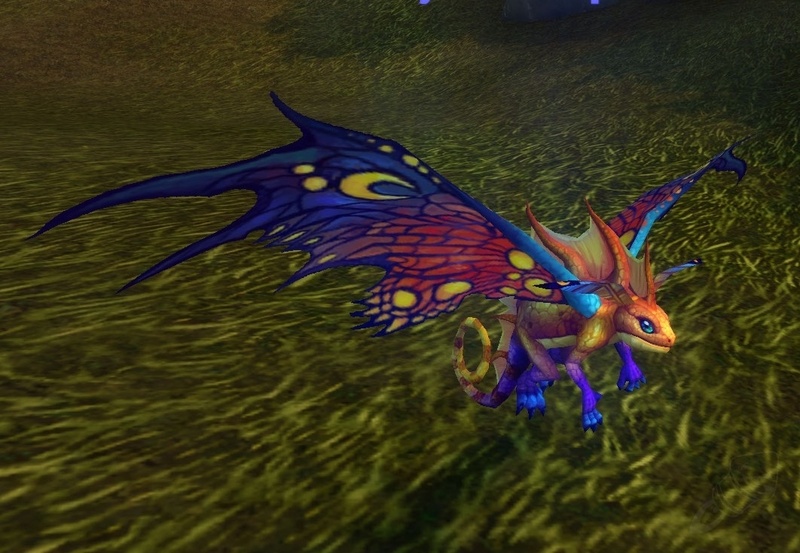 At some stage I went to Warcraft Pets to update my collection and saw this little guy: The picture is not mine (the pic is linked to the WoWhead profile of its owner)- I having been working at it all day, but I don’t have him yet. Apparently, there’s a bit of a puzzle in a cave in Winterspring to acquire this beauty. The puzzle requires rare Burning Crusade protection potions, early game inscription scrolls, Noggenfoggin elixir and a whole shopping list of stuff. Now, some of the things are available online for a hefty price. But what would be the fun in capitulating straight away. My alchemist has been farming recipes, and we’ve been to Northrend to get some sucker fish. Tomorrow, Helvette needs to go to Dire Maul and the Grim Guzzler. Maybe sometime tomorrow I’ll have him 🙂 Yay! This is a fun way to get back to older recipes and reward those of us who have kept old mats and stuff. Well done Blizzard. The first person to figure it out handily wrote a guide here. Well. I logged into my WP blog just to upload a couple of awesome screenshots of Witcher 3’s Yennifer, and JUST LIKE THAT, I screwed up all my file directories and lost (hopefully I’ll get it back with patience) a TON of old blog posts from Strumpet Speaks. I’ve spent about 18 hours now reinstalling WP installations, cleaning up the ‘flow’ of all my crap, and generally flailing. I’ll get there. But I still wanted to share these Yennifer shots! !